WHS student Ethan Bryers and his bronze in the 400m 14-year-old boys 400m freestyle, the only medal for Whanganui. The Toyota Whanganui Swim team ended the winter season with a loud knock on the door of future national qualifying after producing solid performances at the New Zealand Short Course Swimming Championships in Auckland last week. The meet marked the culmination of the winter swim season and the five girls and one boy did the centre proud. The team comprised of five girls ranging from 18-year-old Shannon Schimanski, who was attending her sixth NZ Short Course Champs, to 13-year-old Cheyenne Nightingale, who was at her first full national meet. The other girls swimming were 16-year-old Katie Kerins, 15-year-old Amelia Cronin and the well-performed 13-year-old Cayden Earles. Representing the male swimmers from the club was distance swimmer Ethan Bryers, who was contesting the tough 14-year-old races after moving up from his successful National Age Group campaign in April this year. Bryers was the most successful of the Whanganui swimmers at the meet whose best placing was an outstanding bronze medal in the 400m freestyle, covering the 16 lengths of the 25m pool in a slick 4:12.28, just over a second behind the silver medal winner. He also excelled in this event with an open (all ages) placing of 30th overall, an outstanding result by someone so young. 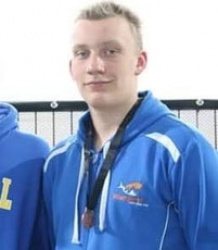 Bryers also secured two fifth placings in the 200m individual medley and the 200m freestyle, sixth in the 400m IM and a ninth in the 1500m freestyle. Schimanski again featured in the finals, picking up a number of top-10 age group placings and making the open finals in the 50m and 100m breaststroke events with ninth and 10th placings respectively. In her 17-18-year-old age group she placed fifth in the 100m breaststroke, sixth in the 50m breaststroke and seventh in the 100m IM. Earles once again performed well at this level with four top-10 placings. Her sixth in the 100m breaststroke was less than 2s off the medals and the 50m breaststroke where she finished ninth in a log jam with less than 1s splitting third to ninth. She also placed seventh in the 200m breaststroke and swam a personal best to pick up 10th in the 50m backstroke. Nightingale picked up valuable experience during the week and at the end of the week faced the gruelling 200m butterfly where she dead-heated for a ninth equal finish. The Whanganui girls also contested the 4x50m freestyle and medley relays. These are open races and the Whanganui team had two 13-year-olds, a 15-year-old and an 18-year-old. Schimanski (backstroke), Earles (breaststroke), Nightingale (butterfly) and Cronin (freestyle) swam a great race to finish 25th. The freestyle relay team of Kerins, Cronin, Earles and Schimanski took more than 2s off their seed time to gain a credible 19th out of the 31 starters. With this likely to be Schimanski's last national meet competing for Whanganui as she heads off to university next year, it marks the end of an era. The team, however, remain in good stead with a number of swimmers knocking on the door of qualifying for national meets and some highly promising juniors coming through. 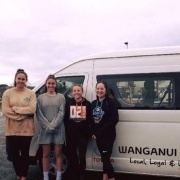 The Whanganui Swim team would like to thank their sponsors Whanganui Toyota and the St Johns Club, without whom the swimmers would struggle to be able to make the trip to these national meets. Five of the six-strong Toyota Whanganui Swim team before heading to the New Zealand Short Course Swimming Championships last week.